The Dandenong Valley Historic Car Club was formed in February 1974 by Allan Tregea, Steve Duckett, Denis King, Dennis Renolds, Laurie Plowright, Dennis Jones, Martin Utber, Lindsay Tharle and John Cochrane who believed there was a need for a Historic Car Club in the Dandenong Valley Region. The first meeting was at the home of Allan Tregea on February lst 1974. The second meeting in March was called by a single page Newsletter. Vic Archer, Winton Platt and Ernie Hopgood attended also, and these twelve people are considered the founder members. At this meeting each member contributed $1.00 and proposed a motion for a membership drive. The name of the Club was agreed to, and a competition held to design a Club Badge. This was subsequently won by Gwen Tregea at the August meeting. It is Gwen’s winning design (based on their 1929 Essex Sedan) that remains today as the Club emblem. The Club has always met on the first Friday of every month including January at 8.00pm. The Club presently meets at the Dandenong Agricultural Society Club Rooms at the Dandenong Showgrounds in Bennett Street Dandenong. The Harlequin Soccer Club’s Clubrooms in Glassocks Road, Bangholme which became home for the club, as for some time, we had sole use of this property. Working bees cleaned and prepared the rooms for meeting while outside the grounds were tidied and a gravel driveway installed. It was here that the Dandenong Valley Historic Car Club held its first swap meeting. When the property came up for sale we looked at the possibility of buying it for ourselves, but we did not have the resources and it was sold. We continued to rent the Clubrooms from the new owners. We went back to the Rachabites Hall in Dandenong prior to its demolition for a short time while the owners lived in the clubrooms and built a new house on the property. However it was time to find a new meeting place and Lindsay Tharle organised the Dandenong Agricultural Society Club Rooms at the Dandenong Showgrounds where we presently meet. The first Newsletter Volume 1 Number 1 came out in August 1974. The first Cover Design appeared in November 1974 and lasted until October 1975. Since that time we have had an Annual Newsletter Cover Competition resulting in a different cover each year. The first Newsletter was printed on a hand Gestetner followed by an electric Gestetner. Then we used a Computer and an HP Deskjet 880C printer to produce the masters which were then photocopied and collated at Chisholm Institute of TAFE – Dandenong Campus. Today we use the services of Minuteman Press in Springvale and transfer files via the internet. PDF copies are available upon request. In 1978 the D.V.H.C.C. sought and gained permission from VIC Roads to grant “Vehicle Permits” under the auspices of the Club Permit Scheme. In 1984 the D.V.H.C.C. carried out all the necessary work to become Incorporated under the Associations Incorporation Act. This meant a radical modification to the Club’s constitution that had served us well. A solicitor, John Mullany from Emerald, did most of the work to change our constitution to fit the model rules for an association without changing the meaning or intent of the original. 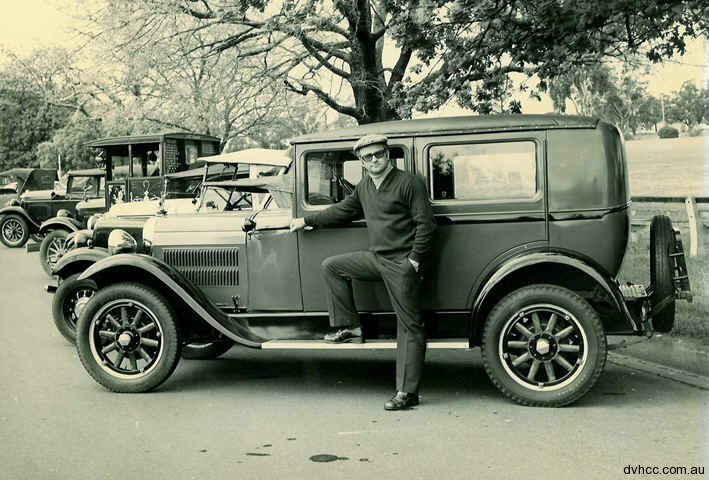 The Club was from now on to be known as the Dandenong Valley Historic Car Club Inc. The D.V.H.C.C. Inc. is affiliated with the Federation of Veteran, Vintage and Classic Vehicle Clubs Inc. The President’s Award, The Clubperson of the Year, The Car of the Year and the Special Road Event (formerly called the “Stirrer of the Year” then the “Contributors Award”) were all made during the first year of the Club from parts donated by the early members. The Touring Trophy was introduced later in an attempt to encourage members to bring their Club Cars along to all events including meetings. The Awards are presented each year at the Annual Presentation Dinner Dance where a theme or fancy dress gets the members out and dressed up for the occasion. Our long established and very highly thought of “Swap Meet” is held at Akoonah Park Berwick on the lst Saturday in February each year. Annual events such the Children’s Christmas Party, the Presentation Dinner Dance and the weekend away on the long weekend in March, along with our regular monthly club run, generally on the Sunday following the first Friday of each month, make for a very social club calendar. 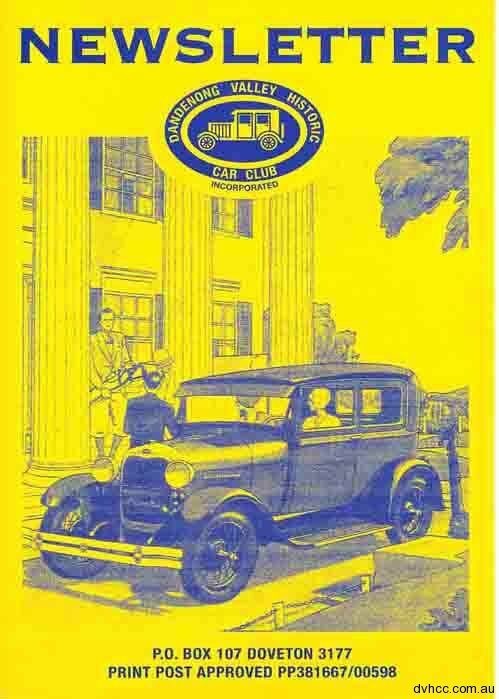 Membership is open to anyone owning or interested in vehicles manufactured prior to December 1942. Lindsay Tharle, Martin Utber, Kevin Clarence, Geoff Tangey (deceased), Les Lucas, Don Jones, John Zeigler, Irwin Sinclair, Bev Sinclair, Peter Lafrank and Stan Snyders.